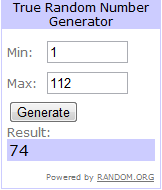 The winner of the giveaway is No. 74, Amy Lynn. Congratulations Amy, I’ll send you an e-mail soon.